A Bristol robotics company has been awarded £6m for its LaserSnake project. The large robotic arm, which is connected to a laser cutting tool, can be manoeuvred around tight spaces in hazardous environments. OC Robotics said it could be used in nuclear decommissioning work to dismantle vessels, support structures, flasks and pipe work. 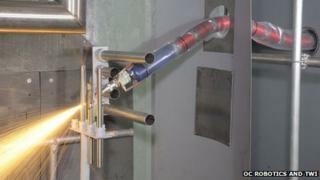 The government funding was announced as part of a £31m boost for nuclear technology in the UK. An initial successful feasibility study into the development of LaserSnake was funded by the Technology Strategy Board, and the new funding will help them to develop the technology to a full-scale demonstration phase. The technology also has the potential to be used across other sectors including the military and construction industries. Rob Buckingham, one of the company's founding directors, said demand was "coming". He said: "What we're seeing around the world is people are really concerned about how to decommission nuclear assets...which weren't really built for taking apart. "It's going to become a really big market over the next few years and decades." Mr Buckingham added: "There was a call for projects a few months back and we were pretty fortunate to win this pretty big support grant. "We are going to end up with some pretty big site demonstrations at the end of the project and that will hopefully convince the end users that this is the best technology to use, and then we are going to take it around the world and export it." He said LaserSnakes cost more than £250,000 each, "probably more than that for the really big ones". He said that while his company was currently small - employing 15 people - he hoped it would double in size over the next two to three years. LaserSnake was one of 35 projects supported by the funding announced on Tuesday for developing new technologies for the construction, operation and decommissioning of nuclear power plants.